Please note we have a minumum order of 2 on this product. Our No Lead Frost Proof Yard Hydrant gives year round water service that drains below the frost line once shut off. This frost proof hydrant has a five foot bury depth. The length of bury depth on the hydrant you need depends on the depth the water lines are buried in your area. Locking eye on head and lever allows hydrant to be padlocked shut when not in use. Recommended maximum operating pressure: 100 PSI. A - Lever Control: Operates by cam principle and pulls straight up on operating rod, provides variable flow from trickle to full flow without lock to hold lever. B - Draw Straps: Made of 1040 hot rolled steel which is much harder (Brinell 175/200) and stronger, greatly reduces wear of straps and eliminates side pull on operating rod. C - Operating Rod: Ground and polished and will not cut out packing and packing nut. Top of operating rod is stainless steel which is connected to a zinc coated steel rod connector which is connected to black rod. D - Hose Adapter: Fits standard 3/4 inch hose fitting. Was nylon but now comes with a brass hose adapter. E - Heavy Cast Iron Head: The same time-proven design that Merrill has used for over fifty years. F - Pivot Connector with Two Nuts: Provides simple positive adjustment and eliminates unreliable set screws used by other companies. Adjustable for years, not like rusting set screws. G - No Lead Galvanized Pipe: Has no exposed threads subject to the weather. H - One Piece Plunger: Uses double seal design to assure positive shut-off even when foreign particles are present. Plunger positively opens drain to prevent freezing and positively closes drain even at slow flow rates. 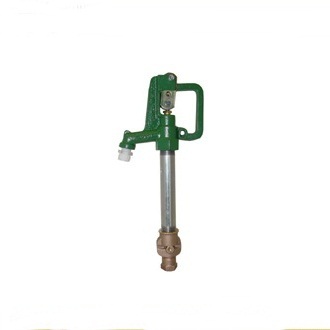 I - Long Life Plunger: Molded with ethylene propylene material that is self-lubricating and will not bond to no lead brass valve body like rubber plunger used by other companies. J - No Lead Brass Double Bypass Valve Body: Provides a large volume of water and the time-proven design used for over sixty years. K - Locking Eye: Locking eye on head and lever allows hydrant to be padlocked shut when not in use. 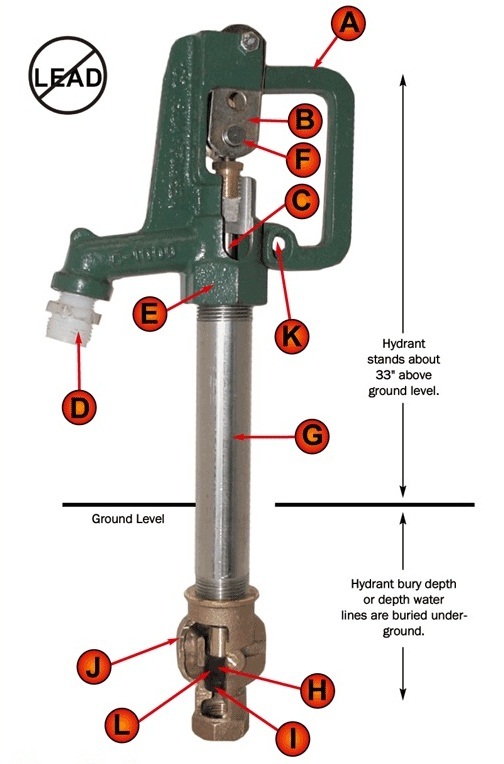 L - Swivel Parts:Permit withdrawal of moving parts without digging up hydrant. Nothing in head assembly to disconnect or adjust when removing, simply unscrew entire head assembly from galvanized pipe and pull up valve stem with plunger for inspection.Very simple repair easily done at ground level. Go to top of this No Lead Frostless Yard Hydrant, CNL7505, 5 ft bury depth page.